Parodius Da! Shinwa Kara Owarai e! What happens when you take the legendary arcade horizontal shmup franchise, Gradius, and add highly suspect mind-altering substances to it? You get “Parodius Da!,” Konami’s first of three arcade roasts of this long-running and very challenging series of games. All the basic game play elements that you know and “love” from the first three Gradiae are still present, so this particular aspect will be old hat for anyone who has already played them. Difficulty-wise, this game is made easier by the fact that you can continue in both versions after losing all your lives and sometimes, the rank will reset upon continuing. Most levels can be completed without too much trouble, but be especially careful on levels 8 and 10. Whereas the difficulty of the Gradius series overall is a 9 out of 10 with 10 being nearly impossible, Parodius Da! is about 6 out of 10. However, like the Gradius series, this game will punish you for over-powering up (especially as Vic Viper). Saying that the difficulty rank increases more sharply here than in the other Gradiae is very accurate. Don’t be fooled: Even though this is parodying the Gradius series, it doesn’t mean it will be a pushover. Note: If you are reading this and have no idea what I just said, play Gradius 1 through 3 now. Everything that follows in this review will make much more sense afterwards. After all, you cannot find a parody funny until you understand the source material. Upon starting the game, you are given 4 choices of ships. 1) Vic Viper: This ship needs no introduction. 2) Octopus’ [Tako’s] weapon configuration comes from Salamander. He is unique to Parodius Da! and its sequels. 3) Twin Bee’s weapon configuration comes from his own game(s) of the same name and the Gradius series. 4) Pentarou’s weapon configuration comes from Gradius 3. He comes from a relatively obscure game called “Antarctic Adventure” released on the MSX console in the 1980s. Auto Power-Up: The game powers up your ship for you when you collect power-ups. This mode is recommended for beginners. Manual Power-Up: Same idea as Gradius 1 through 3. This mode is recommended for experienced Gradius players. The power-up system from Gradius needs no explanation. However, there is one power-up unique to the Parodius series: the Bell-Power. When you defeat certain enemies, a bell appears. By shooting the bell repeatedly, it changes color. The color corresponds with a different ability you can gain by grabbing the bell. The ability is then activated by pressing the button you normally use for dropping bombs/missiles. Blue: Destroys all enemies on screen within the radius of the ensuing explosion. Green: Enlarges your ship and makes you temporarily invulnerable to enemy attacks. You can also go through walls during this period, but cannot shoot at anything. Red: Creates a mini vertical barrier in front of your ship that destroys anything colliding with it. “Parodius Da!” borrows heavily from classical works by Tchaikovsky, Beethoven, Bizet, Rossini, and Grieg, among others. Other game music includes remixes of tunes from the first 3 Gradiae and incidental music for the guest ships in this game, excluding Tako, whose incidental music is unique to this game. Normal enemies in the game can range from crabs, birds, bees, and cats to blue and pink penguins! Yes, you read that right. Penguins … lots and lots of ! @$@%#@ penguins!!!!!!! By the time you finish this game, you will never look at penguins the same way ever again. In fact, you may develop a long-lasting phobia and/or hatred of all penguins as a result. … and without further ado, Parodius Da! This game is meant to be absurd from the get go, and does not disappoint. Everything from Gradius 1 - 3 is parodied, right down to the enemies that attack you before the level starts. O… kaaayyyy….…a flying cat … ship? What the hell? … and this is only the miniboss of stage 1. We still got 9.5 more levels to go! Fire at its head and it will meow as it is hit. Repeat until defeated. With all the penguins in this level, it’s only natural that the boss would be a penguin. Anyway, shoot the enormous wound on its stomach while avoiding the bullets the penguin shield throws at you. Repeat until dead. Again, fairly easy to dispatch for experienced Gradius players. I doubt many people expected that! Then again, this level does look like it’s near a casino, so the likelihood of running into scantily-clad women would be higher than most circumstances, but I digress. 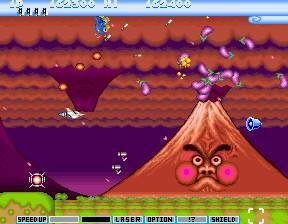 The actual boss of this level is often considered the reason why Parodius Da! was never released in the US , as it mocks one of the US ’s national symbols and probably would have caused a major backlash against Konami as a result. Someone at Konami must really like desserts, ‘cause level 3’s all about mazes full of them! Naturally, every resident penguin in the known universe seems to be there to greet you, too. So the 3rd boss is a bunch of lips firing jaws at you. Maybe there’s a Rolling Stones joke here. It’s level 4, or also known as, “the-Konami’s-from-Japan! !- Of-Course-They-Have-to-Parody- Their-Own-Country!” Level. However, last I checked, I don’t recall sumo wrestlers or mountains being able to walk on ceilings or hang upside down. Definitely avoid the sumos who throw their belts at you and the running sakura tree who appears not long after this image. Seriously, though, who would want to be scarred for life from being hit by a sumo’s belt? Even those ubiquitous volcanoes you see across the Gradius universe aren’t spared from Konami’s weird humor. Pummel him with everything you have while avoiding all the falling crabs, penguins, and fish that the sumo’s movements cause. For the non-initiated, a Japenese company by the name of Irem created a certain horizontal shmup that most arcade enthusiasts regard as the Gradius series’ equal in terms of sheer difficulty and skill required to complete them. This particular game, along with Gradius, was regarded as 1 of the 2 best horizontal arcade shmup series of all time! This level is Konami’s roast of that game a la Gradius. … so what better way to honor Irem by mocking that game’s infamous “Mothership” level … with Moai? You’ll definitely want to shoot this thing in the mouth and nose, or you’ll have a lot of difficulty getting to its underbelly. Could Konami have made this look any more obscene than it already does? Anyway, avoid the obscenely-shaped Moai missiles and shoot it in the eyes. Repeat until dead. Penguins and Pinball! Except this time, it’s at twice the normal horizontal scrolling speed! Double is your friend, but the pinball flippers that appear later are not. Ok, it’s a face! Blast those moving blocks! Bubbles!?!?! Thankfully this level is nowhere near as psychotic as the original. More bunny girls in bubbles! Just be sure to avoid the darts, though. Yes, this is the boss of level 7. Avoid the babies and bubbles while shooting her in the forehead. … and to make things even better, your ship slows down while underwater. Whatever you do, do not die during this section or the next above-water part. Otherwise, without weapons, it turns into bullet hell real quick! Dodge the spikes and shoot him in the mouth. As you do this, he will grow bigger and bigger until he explodes. Konami so missed an opportunity to mock Castlevania and/or Haunted Castle here. Oh, and be careful of the skeletons and flying umbrellas that attack you later on, too. I don’t get it. Seriously. A Japanese Inside joke, perhaps? When she first appears, she tries to pursue you as a giant cloud. Play keep away until she reverts to the form on the right. Shoot and shoot her while avoiding the blue and red flames until she explodes. Level 10, the Final Level … I’m definitely not spoiling this one, especially since the Final Boss is quite a gag. Simply put, this game is required for all Gradius fans. If you are a Gradius fan who has still not played this game and/or its sequels, you ought to be ashamed of yourself! Although the game is a little long, Parodius Da! is still a fitting first arcade roast of this very challenging series of horizontal shmups.